One of the traditions of attending an Irish wake is to take something to feed and comfort the family during their grief. Even if the family doesn’t practice “sitting up with the dead“, a potluck gathering often is held to remember the deceased. One such dish is an Irish Wake Cake. This recipe is adapted from another one of my odd cookbooks, DEATH WARMED OVER, by Lisa Rogak. It is an interesting collection of recipes and customs surrounding feasts for funerals and for the dead themselves from 75 different cultures and religions. As a taphophile, I am fascinated by the many various practices of mourning the dead. Sharing food is just one way to ease the burden of those survive the loss of loved ones. Another interesting fact, pointed out in this book, is that most people eat a lot more food at funerals than they do at weddings. So rather than talk about catering, instead, we return to a simple wake and the idea of bringing a dish over to visit, reminisce, and share a life and a meal together. This “Irish Wake Cake” is a fine variation of an Irish cream cheese pound cake. It is is simple, rich, and delicious. Preheat your oven to 325 F degrees. In the mixing bowl, use an electric mixer to cream the butter, sugar, and vanilla together. Beat in the eggs one at a time, then add the cream cheese, mixing until thoroughly combined. Add the flour, baking powder, and salt, mixing until thoroughly combined. Gradually add buttermilk and mix until you have a smooth batter with no lumps, then fold in the currants. Pour the batter into a greased 9-inch loaf pan. Place the pan on the center rack in your oven and bake for about 1 hour 20-25 minutes, or until a knife comes out clean for a test. Remove to a cooling rack and let the cake cool down for 15 minutes. In a small bowl, combine the powdered sugar and lemon juice, then drizzle that icing over the cake while it is still warm. Let the cake cool down however before serving it. Slice the cake and serve with a dollop of clotted cream or whipped cream. There is a lot of dairy and fat, but substitutions will probably not work as well. You may be able to use margarine instead of butter and soy milk instead of buttermilk. There’s even vegan “cream cheese”. The ratios for everything might need a little tweak here and there if you go that route. If you can’t find cake flour, you could use all-purpose flour. 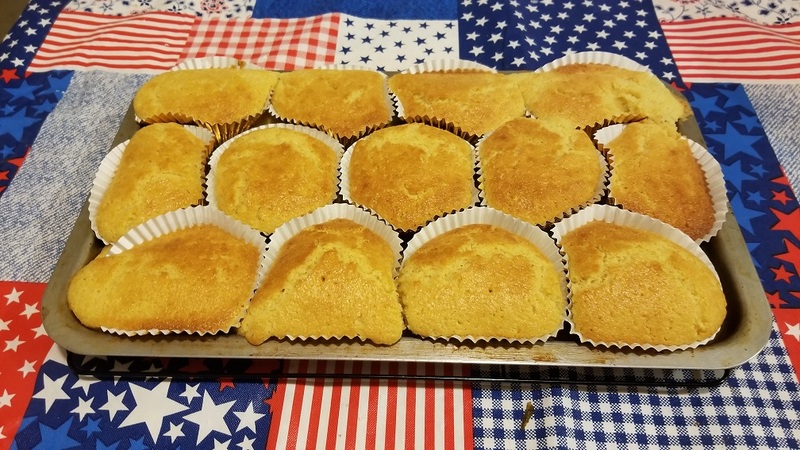 The difference is that cake flour is milled to be finer and it also has less gluten, which means your cake will be light and fluffy, instead of dense like bread. If you are going the gluten-free route, use a 2:1 mix of flour to starch (like 4 oz superfine rice flour and 2 oz tapioca starch). I did have trouble finding currants but I didn’t want to use raisins. Instead, I found these incredible blueberry-infused dried cranberries. Those were very tasty and worked well with the tangy, lemony glaze. I discovered that other recipes for Irish pound cake use Irish cream liqueur instead of the buttermilk, also instead of the lemon juice for the icing. Depending on who you are baking the cake for, that might be a welcome change to the recipe. This recipe came together so fast, I didn’t really have time to take photos of the steps. That’s how easy it is to make this cake. The hardest part was waiting for it to bake. I served it with a little homemade whipped cream. Clotted cream would have been better, but that stuff takes forever to make. This cake is so good, trust me, you will be finding reasons to bake it. People die all the time, after all. Good food is a beautiful way to honor the dead and celebrate life. When it comes to the holiday spirits, I’m not talking about the Ghost of Christmas Past, or that chain-rattling spectre of Jacob Marley. No, I speak of something even more frightening: Holiday Hooch! As the song goes, “Baby, it’s cold outside.” One sure way to stay warm is with a little nightcap. It’s no surprise that many drinks this time of year are heated up. Hot buttered rum, egg nog, mulled wine, just to name a few. Hot apple cider and hot cocoa shouldn’t be missed either. So in keeping with the intoxicating tradition, I am sharing three of my favorite drinks that will make the season, and your nose, bright. Just stay safe, my fellow Horror Addicts. We want to see you have a prosperous new year. This drink is one of my own devising. Instead of mundane eggnog, I leave this as a treat for Krampus. When he visits my very naughty children, this tends to please him and he has yet to torture my kiddos. Clearly they have been very naughty if Santa is not only forgoing the coal, but sending Krampus to punish them. I like to think this drink encourages his mercy. They are just children after all, and I believe that children are our future. Oh, sorry. Almost broke into song there. My apologies. First, either prepare a small batch of Sanguinaccio Dolce sauce, or melt some dark chocolate in a double boiler, and set aside. In a medium saucepan, heat up the half & half and sugar, over high heat. Stir until the sugar has completely dissolved. Remove from heat and allow to cool for about 5 minutes. In a blender, add the eggs and sanguinaccio dolce (or melted chocolate). Blend on low speed for about one minute. With blender still running, slowly add the warmed half & half and blend for about 30 more seconds. Add the alcohol and blend until the everything is frothy, about 2 minutes. Some people like warm nog. If so, serve immediately. If you and your guests prefer chilled nog, put your blender carafe into the fridge and chill for at least an hour. When ready to serve, put the blender carafe back on the motor and blend for about 30 seconds to combine everything together again and restore the froth. Pour into glasses and serve with dashes of nutmeg, cinnamon, and cocoa powder. This recipe makes just about one quart, a perfect amount for the average blender. If you want to make a party punch bowl version of this, then multiply by however many quarts your punch bowl can safely hold. Just remember that this is an egg-based drink. It is not a good idea to let this just sit around at room temperature. I used to make this with Kahlúa, as the coffee and chocolate flavors go together so perfectly. Then I discovered Tia Maria, and ditched Kahlúa like a bad habit. I personally find it to be smoother and less sweet. However, my beloved wife hates coffee. In an attempt to alter this exalted recipe, I have found that black spiced rum adds a deeper spice to the drink as well as a darker hue to the beverage that is in keeping with a drink fit for Krampus. Of course, for a twist on the horror angle, you could try REDRUM. If you try that, let me know how it tastes. Finally, let’s address the demon in the room. Yes, sanguinaccio dolce is my traditional chocolate sauce for this drink, and yes, it contains pig’s blood. Of course you can melt chocolate or even use chocolate syrup, in a pinch. I do understand if drinking a small amount of pig’s blood turns you off… in a drink made with chicken eggs. And booze. I have had more compliments on this drink when made with sanguinaccio vs. mundane chocolate. In the end, I leave it up to you. This is delicious any time of year, but I inevitably get asked to make it during Yule and Christmas Eve parties. I hope it becomes a tradition at your home as well. For us it has been Dad tested, Krampus approved. This twist on the traditional mimosa is named after Bela Lugosi and features the juice of blood oranges. It has become a favorite for a toast on New Year’s Eve, as well as for brunch on New Year’s Day. In a champagne flute, pour blood orange juice and champagne. Add grenadine to provide extra color. Garnish with a slice of blood orange. It can be hard to find blood oranges year round, but they are in season during the winter. That makes a New Year’s toast with this drink the perfect time to enjoy it. “I never drink… wine,” said the Count. I’m sure he would have added, “vithout bubbles.” No? How about this… “Bela Mimosa’s dead. Undead, straight to my head.” Admit it. You’re singing that right now. My work here is done. In the Christian tradition, the Feast of the Epiphany is held on January 6, celebrating the birth of Jesus and the visit by the three wise men. The night before Epiphany is known as Twelfth Night, as it is the twelfth night of Christmastide, following Christmas. For those that might follow an older path and celebrate Yule instead, Twelfth Night follows as well as the end of the Yuletide celebrations. However as Yule begins on December 20th, this means Yuletide Twelfth Night is December 31st, the end of the year. In both traditions, there is a toast to good health and good harvest, called a wassail (from the Old English wæs hæl, which means “be you healthy”) which was raised with a drink of the same name. Hot wassail is a cousin of mulled wines and ciders, but is instead usually made with mead or ale. Lambswool is but one ancient version of the drink which keeps the apple pulp in the drink. In a large saucepan, combine the mead, cider, and ginger beer. Add the sugar, cinnamon stick, nutmeg, and cloves. Cook over medium-high heat to dissolve the sugar and meld the flavors together. Remove the cinnamon stick and cloves, then add the applesauce. Cook over medium heat for 5 minutes, stirring occasionally. Pour mixture into blender and puree together until the apples form a frothy head. Yes, the traditional recipe requires coring and baking six apples (at 250°F for about an hour) then pureeing them. Normally I’m all about the traditional methods and freshest ingredients. However, we’re talking about making applesauce, which you can so easily purchase. For once, I say use the store-bought jar of applesauce. Just get the kind with no sugar added and no funny extra ingredients. I love a good mulled wine, but I think a hot lambswool wassail may be the best thing to kill the chill of Twelfth Night. Once upon a time it was hard to be a baker. Bread being so vital to the common diet, for rich and poor alike, laws were passed to make sure that bakers did not cheat their customers with light loaves or unhealthy fillers. To make sure that their customers were happy, often times it was better to make sure that an order was filled that was over weight rather than under. Thus, many bakers started giving away an extra cookie or muffin with an order of a dozen. Thus, a baker’s dozen is 13. Normally one might consider 13 to be unlucky, but now it has probably spared a lot of bakers from harsh penalties like having their hands chopped off. Did you know, however, that if you don’t use a muffin tin, which often have either 6 or 12 cups, that you can bake better muffins in 13 paper-lined foil cups? It is true! 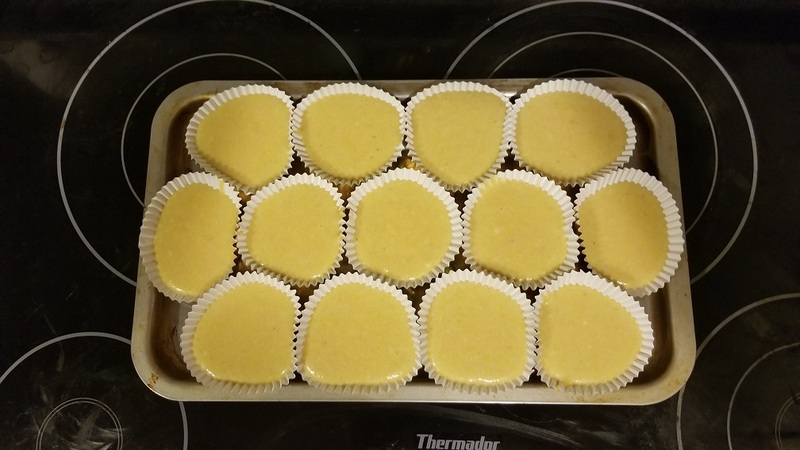 Placing the cups on a baking sheet in a tight 4 x 5 x 4 pattern bakes the muffins more evenly and nets us exactly 13 muffins. I call these honeycomb muffins because they resemble the hex-pattern of honeycomb. Note also as they cook, these muffins will push even closer together and the resulting muffins will take on a more hexagonal shape rather than round. If you want perfectly round muffins, you might need to double-up the cups, or if you have mason jar rings, you can set the cups in the rings to help them retain their shape. If you find, however, that you’ve actually been cursed like the baker from Into The Woods, here’s a recipe that might do the trick to get on a witch’s good side. Preheat your oven to 400°F/200°C. In a large bowl, mix your dry ingredients together and incorporate well. In the other bowl, whisk together the wet ingredients. Add the wet to the dry and then stir to mix well into a thick batter. Place foil muffin cups with paper cups inside them on a baking sheet in a tight 4 x 5 x 4 pattern. Divide the batter into the 13 cups and bake for about 15 to 17 minutes, until the tops are golden brown. If you want to make a gluten-free version, feel free to use your preferred GF flour mix, but be sure to measure by weight (120g). Note for example the difference between the flour and sugar. They both weigh the same, yet it only takes ½ cup of sugar to reach 120g vs. a full cup of AP flour to weigh the same. These are delightfully sweet without being too sweet. If you would prefer even sweeter, I recommend adding stevia. Adding more sugar or honey will change the consistency of the batter. Stevia powder however enhances the sugar already in the recipe but very little goes a long way. Serve these with a fresh batch of magic kidney beans (red as blood) and rice. Cursed objects come in all shapes, sizes, and purpose. The first cursed object I could think of, that wasn’t related to the TV show Friday the 13th, was the lamp or bottle that trapped a genie inside. While we have Aladdin and the cursed lamp from One Thousand and One Nights to thank for being the source of this legend, the idea of a “genie in a bottle” hails primarily from Barbara Eden’s TV sitcom I Dream of Jeannie... which in turn was inspired by a 1964 movie starring Barbara Eden called The Brass Bottle. As for bottles with spirits trapped inside, I naturally decided a cocktail was in order. I’ll admit that a certain cartoon genie inspired the color. Into a drink shaker, add all ingredients including ice, cover and shake. Pour into a hurricane glass, or a bottle for fun. Arak is an Arabian alcohol produced in the Levant region, which does not adhere to the Muslim avoidance of liquor. It is made with aniseed and it louches becoming cloudy when mixed with water, hence my suggestion to substitute ouzo or absinthe if you cannot acquire the Arak. Plus absinthe adds to the color, especially if you can find a blue absinthe. After a few of these, you too will believe there is infinite cosmic power in an itty-bitty living space. Just be careful what you wish for. There are many superstitious actors who will tell you about various curses of the theatre. Like how they can’t wish each other good luck, but rather “break a leg”. The most famous, however, may be to not say the name of The Scottish Play. This is brought most humorously to light on an episode of Blackadder The Third. 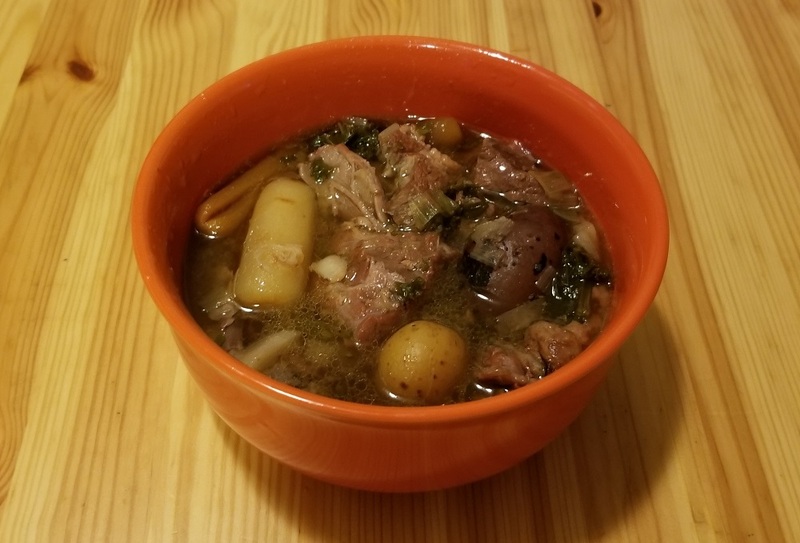 To honor the Three Witches, all items in this stew come in threes. We’ll be making this in our magic cauldron (called a pressure cooker). Chop all of the veggies first and set aside in the groups listed above. Pour 3 Tbsp of oil with a high smoke point (like corn or peanut, or even ghee or clarified butter; canola is the lowest smoke-point oil you should use) into the pressure cooker. Turn heat to high. Cut the lamb and beef into large chunks (save the bones) and season with salt, pepper, and paprika. When the oil begins to shimmer, brown the lamb and beef on all sides. Remove and set aside. Reduce heat to medium. Saute the leeks/onion and garlic for about 1 minute. Add the flour and stir to combine. Deglaze with the ale. Then add the stout and scotch. Place the bones into the cooker first, then add the meat back, and then the rest of the ingredients. Top with 3 pints of water, or as much as you need to just fill under the Max Fill line. Return the heat to high. Close and lock the lid. Cook on high until pressure valve whistles or rattles, then turn heat down to low and cook for about 33 minutes under pressure. Remove the bones, bay leaves, and herb sprigs. Meat should be tender and the veggies supple. Ladle into bowls and allow to cool before serving. We are using about 1.5 pounds of bone-in meat each because we want the bones for the stock. Once cooked, we’ll have about 3 pounds of meat. If you don’t have a pressure cooker, you can use a large crock pot and cook on high for 333 minutes, or about 5 1/2 hours. It is much harder to make what is essentially the stock this way, however. Definitely serve with whisky or ale or stout. Can’t decide? How about a whisky barrel-aged ale? Or a Half and a half? A wise man named Penn Jillette once said, “Everybody got a gris-gris.” Gris-gris (pronounced gree-gree) is a French term from voodoo for the medicine pouch that vodouisants wear around their neck. What Penn was saying, however, is that we all have something that we cling to, whether it be something tangible to bring us good luck (or ward off bad luck), a belief, a superstition, even a firmly and long-held conviction that centers us or even defines us. That something, according to Penn, is the one thing we should scrutinize first and foremost in our lives and try to change about ourselves, hard as it may be. For me I think it is fair to say that my gris-gris is food. Now, I know what you’re thinking. “Dan,” I hear you say, ”we all need food.” Yes, which is why we should scrutinize it. I fear that so many folks walk through life just throwing anything bite-sized (or super-sized) down their gullet without thinking about it. It is one of the reasons why I started Morbid Meals. We must eat to live, which means something else must die. We don’t like to think about that, though. We’ve pre-packaged, homogenized, and mass marketed products so that we don’t have to think about where our food came from. That nicely fits a model of consumption not sustenance. Now I’m not saying we should all jump on the latest food fad of dietary detritus. That too is a gris-gris; putting your faith in what somebody else says is good for you, bad for you, will help you lose weight, etc. The corollary to my mantra is that we are all going to die no matter what we eat. Some food will kill us faster than others, but an acceptance of moderation is really what I’m advocating here. Everything in moderation including moderation. You’ve likely noticed this at play in my recipes here before. Many of them offer alternatives for those with dietary restrictions, suggestions for alterations, never requiring you follow these recipes to the letter. I’ve also presented my share of crazy creations that would be fun to try at least once, and then you can go back to eating healthy or whatever. Live a little while you can. Food is life, food is love. So, I’ll step off my soapbox and say that if you need a gris-gris, why not try a little bit ah Gris-Gris Gumbo Ya-Ya, hey now. Doctor’s orders. Dr. John, the Night Tripper, that is. Now before y’all freak out, this recipe makes a lot of gumbo. It is meant to be shared with a large family. (The loas might like a bowl, too.) We also love having leftovers. Gumbo gets even better when you put it up and eat it the next day. Feel free to divide in half if you prefer. It also takes a long time to cook, like almost 3 hours. Gumbo is not fast food. It is completely worth the effort. Chop all of the veggies. Do this first. You’ll thank me later. Divide the onions into half portions (one for the stock and one for the gumbo). Divide the celery in half as well. Set aside. Into your pressure cooker, add the carrots and the first portions of onions and celery, along with the salt, seasoning, and bay leaves. Cut up your chicken and arrange all of it, including the bones, fat and skin, giblets, gizzards, etc., into the pressure cooker on top of the veggies. Pour in the water, but make sure NOT to go above the “maximum fill” line. Cover with the lid and lock it down. On the stove top, turn the heat to high and bring up to pressure. When you hear the pressure release whistle, reduce the heat to low, for a steady low hiss. Cook for 30 minutes. Release the pressure and open the cooker carefully. Strain the stock into a container to cool. Reserve 3 quarts of stock for the gumbo. (If you have more, save it to cook the rice.) Separate the chicken meat from the bones and set aside. In a large stock pot or Dutch oven, heat the oil over high heat until it begins to shimmer before it reaches its smoke point. Reduce your heat to medium and carefully whisk in your flour in small batches, which should immediately begin to sizzle. Whisk constantly for about 15 to 20 minutes, or until the roux turns a deep brown color, like milk chocolate. Lower the heat to medium-low and stir in the remaining onions, celery, and bell peppers. Stir occasionally for another 10 minutes, or until the roux thickens and turns a glossy dark brown color, like dark chocolate. Into the pot with your roux, still at medium low, add your okra (if using), garlic, and chopped andouille sausage. Stir occasionally and cook until all of the vegetables are soft, about 8 to 10 minutes. Add your reserved 3 quarts of stock and stir until the roux is well combined with the stock. Raise the heat to high and bring to a boil, then reduce the heat to low and cook, uncovered, for 1 1/2 hours. Stir occasionally to keep everything well combined. Now you can add the cooked chicken and the chopped tasso ham to the gumbo and cook for an additional 15 minutes. Turn off your heat and let your gumbo cool down for at least 5 minutes. This stuff is very hot. Serve with steamed rice. If you like, add hot sauce to your taste. Let’s address the okra first. I love okra, especially fried, but most folks I know can’t stand how gummy it is. That’s what makes it gumbo, though, in my humble opinion. In fact”gumbo” means okra. It does tend to be optional in a chicken and sausage gumbo. It is more common in a seafood gumbo. Okra adds an earthy flavor and extra thickness, for even though we are adding a lot of roux, a dark roux doesn’t thicken gumbo very much. (A light roux will thicken more but has less flavor.) Don’t use “okra season” as a reason to skip it either. You can probably find frozen okra out of season. If you can’t find tasso ham, you can substitute with smoked ham or regular smoked sausage. Can you make the stock without a pressure cooker? Sure, but it will need to simmer for at least two hours. Save your hot sauce until the end. Again, trust me on this. I know cajun and creole foods can be spicy but not everyone can handle it. Also, we’re using andouille sausage and creole seasoning, where various brands have different levels of heat. This is why I suggest adding the hot sauce at the end to your own personal taste in your own bowl. Once you make it often enough and you use brands you are familiar with, feel free to spice things up. One of my favorite stories about Marie Laveau was that she often made large batches of gumbo and would give bowls of it to condemned prisoners in New Orleans, as well as feeding it to the sick and poor. 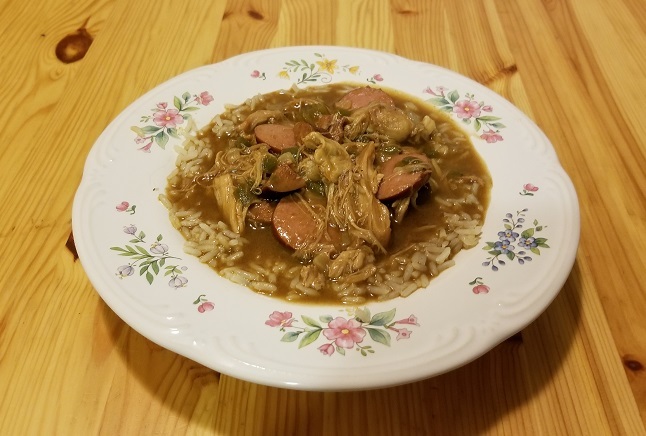 I don’t know how true this story is, or the tales that mention a few other medicinal herbs which might have made their way into the gumbo, but I do know the power of a good bowl of gumbo and rice to make everything all right with the world. What horrors will our technological hubris bring us in the future? When technology takes over more of our lives, what will it mean to be human, and will we fear what we have created? Artificial intelligence, robotics, bionics and cybernetics, clones, and virtual reality. These are a few of my favorite things. The technological singularity is fast approaching, and post-humanity is a frighteningly dark future. First and foremost, your submission must be a horror story and contain something emotionally, physically, or mentally horrifying. Secondly, the technology should be front and center, not just a deus ex machina. Whether it be a modern technology we are creating now with a purpose yet fully realized, or some new horror as yet to be discovered. We are looking for stories in the same vein as NETFLIX’s Black Mirror. Post-apocalypse is welcome, as are dystopian societies, but technology must have brought them about. Supernatural elements are welcome in conjunction with the technology. What we don’t want is aliens attacking humanity as the core conceit. What qualifies as “modern” technology is debatable; anything from the Cold War is the farthest back we’ll consider. *Following pages header to state: story name, and page number. *With no header on the MS, the header info should be in the email as such: author name, mailing address, email address, and word count. Return time: Final decisions will not be made until AFTER the submission close date (10/31/18). You should expect a return within three months of the submission close date. If you do not receive an email stating your manuscript was received within two weeks of submission, please send a polite query to: horroraddicts@gmail.com.